Our cakes can serve from 12 to 100 people and come with a single layer of our best vanilla ice cream. You choose your other layer flavour from our list of available flavours. Once you've chosen your flavour, select a top for your cake. You can choose from children's images, AFL logos, WWF designs and there are even some for grown ups! Valhalla offer all our clients complimentary candles (maximum 12) and an individually piped personal message - just let us know how many candles you need and what personal message you'd like piped on your cake. We need a minimum of 4 working days between when we get your order and when you can pick it up from our store at 51 Albert Rd Moonah (find out how to get there). We require full payment at time of pickup. Our round cakes can serve from 12 to 40 people and come with a single layer of our best vanilla ice cream. Once you've chosen your flavour, select a top for your cake. You can choose from children's images, AFL logos, WWF designs and there are even some for grown ups! Our square cakes can serve from 15 to 100 people and come with a single layer of our best vanilla ice cream. Once you've chosen your flavour, select a top for your cake. You can choose from children's images, AFL logos, WWF designs and there are even some for grown ups! 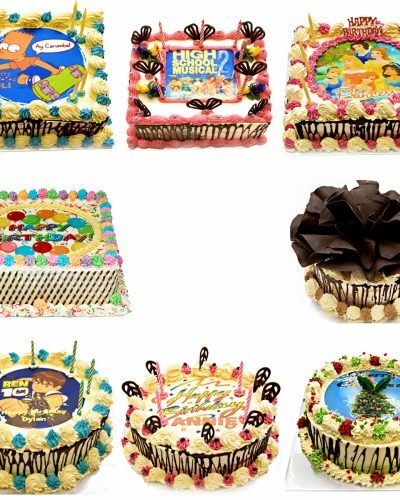 Our specialty cakes come in a range of designs. Suitable for Christmas, Birthdays and celebrations for small groups. All specialty cakes are approximately 8" and serve 12-15 people.